I walk by them every day. Each spring we plant more sunflowers than we will ever harvest. This isn’t so hard, a sunflower or two will produce all the seeds we’re going to eat for a year. We plant the rest for birds to partake during late spring and early winter. By now, they have figured out how to get the last seed out of the flower head. So, I walk by those stems and flower heads that were so green and yellow last summer, each day, without thinking much about them. Then the sun came out. With sunlight touching the snow buildup on each head the sunflowers presented a beauty that comes after life has slipped away. One good thing about frozen fog mornings in December is the sound. The sound of quite frozen fog mornings is unlike anything else. Unlike mornings of snow-covered landscape that encases movement and sound, frozen air allows the wheatgrass to move with the slightest of breeze. The grasses dampened rustle plays with the conversation of two chirping birds which mingles with crunching frozen grass below each boot step. Frozen fog, a natural symphony of sorts. Early spring tastes like a mild Chile Relleno with a dollop on vanilla ice cream on top. The day is sure to be sunny, warm, and mild. Before warmth, though, you have to wade through the cold. Spring mornings give wonderful flavor; you feel the sharpness of the last vestiges of winter in a heavy jacket, raising memories of icicle days. As morning moves to spring afternoon, hawks fly warm updrafts, the jacket is shed, and mild warmth engages the senses pulling up seasonal memories of squash and tomatoes that are sure to come again. Sometimes, there is little difference between dessert and meal. Why Not Invite Everyone to The Meal? There are mornings when the cold fog settles in so tight you can almost feel ice floating in the air. Walking to the barn on mornings like this you wonder why the animals, why the daily feeding? More times than not the answer is simple and perhaps a little selfish, you feed because it lifts the spirit. Sometimes feedings raises the spirit of five thousand. Other times spirit slips through the arena of open table grace. Once in a while though, spirit flings open arms and cries from top of the fence post to relax, eat, and be well as one created family. Such mornings are like having a birthday. Everyone—preparers, servers, eaters—are welcomed to share the meal. Quite nestles in during early morning hours before landscape awakens. The cold air and falling snow softens sound. This morning is one of those mornings when you feel alone and special walking to the barn in crisp hushed light. Even the sound of boots moving through snow is swallowed by the morning air. The animals have little notion of doing much with snow just outside the barn, so entering the barn is silent. In silence, snow blesses landscape. We now have had a few days with the highs above freezing. The valley snow is melting while the north side of the ridge is grudgingly holding onto its snow. Fourteen days of snow this time of year makes one wonder if the la Niña predictions of a cold and wet winter are true. A slight change in weather brought fog to the farm and surrounding landscape. Little change in temperature though. Introducing fog to freezing air changes the face of the landscape. Not so much a new face, but more like your grandfather going a few days without shaving. Vegetation is as it was a few days ago but now ice particle upon ice particle have highlighted contours bringing out character unnoticed before. An ever so slight breeze keeps the windward face open while ice encases the remainder like a hood with strings tightened around the face. 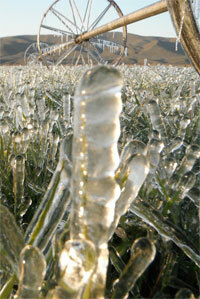 Ice accumulates and flows to the leeward, giving the one rooted in place the appearance of movement. Frigid, closed in, fog filled mornings brings about a certain gracefulness.